Jan D'Atri > Jan’s Recipes > Recipe > Pumpkin Spiced Latte and More! Pumpkin Spiced Latte and More! The PSL started as a LTO but because of people’s FOMO, AFAIK, it’s our top #fallobsession. (No need to grab the Urban Dictionary. What I’m telling you is that the Pumpkin Spiced Latte started as a Limited Time Offer but because of people’s Fear Of Missing Out, As Far As I Know, it’s the thing we obsess over every Fall!) So this year, I’m all in. 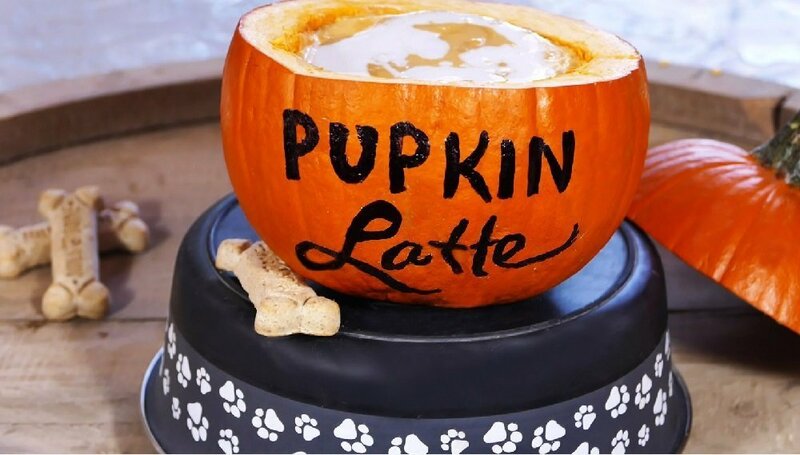 I have a delicious pumpkin spiced latte recipe for you, a perfect Pupkin Latte for your pooch, and I’ve even included a tasty Pumpkin Pie Milkshake for the kids! A note about the ingredients for your pup! Because dogs don’t digest dairy very well, my recipe lists coconut milk which is ok for dogs. In fact the American Kennel Club says that coconut milk can strengthen their immune system by fighting off viruses and can also help with bad breath and clearing up skin conditions like hot spots, flea allergies, and itchy skin. Also, the fiber in canned pumpkin has proven to benefit dogs’ digestive tracts. But! All things in moderation. So small servings are best! As for you and your pumpkin spiced latte and milkshakes–go ahead and sip, savor, slurp and obsess over PSE–Pumpkin Spiced Everything! We can’t seem to live without it. In a saucepan over medium heat, combine milk, pumpkin puree and honey, syrup or sugar. Cook until hot but not boiling. Remove from heat and whisk in coffee, pumpkin pie spice, vanilla and pumpkin pie spice. Pour into two mugs. Spoon whipped cream over top. Sprinkle with a small amount of pumpkin pie spice. Enjoy! Don't have Pumpkin Spice Mix? Here's how to make it!